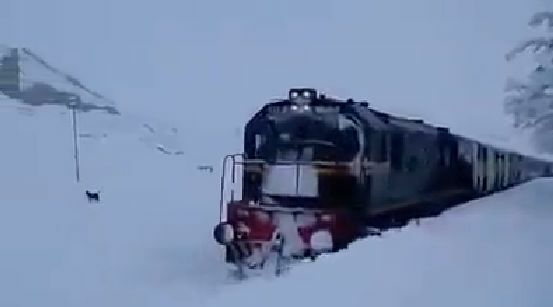 There are many videos on the social media networks showing trains passing through heaps of snow, shoveling away showers of snow to the sideways as the travel through tons of snow stacked on the railway tracks. It is really fascinating to watch such videos. The Quetta section of the railway in Balochistan province of Pakistan passes through very high elevations including one Kan Mehtarzai once again. The place between Kuchlag and Muslimbagh became the highest railway station of Asia, located at a height of 2,224 metres (7,295 feet). I wrote about Kan Mehtarzai in one of my earlier posts. and it too gets covered in snow during winters. Many years ago, I had a chance to travel by train to Quetta in winters and saw snow covered surroundings as the train moved on. In those days there were no cell phones, what to talk of camera phones so that I could take videos or even still photos of the area. I regretted to even not having my camera with me.